Didn’t you just LOVE Vicki’s beautiful projects on pages 41-43 in the winter 2009 issue? Well we did too, and we knew our readers would like to recreate them. Here are the instructions for three of Vicki’s stunning holiday projects. Paint a small clay pot with white acrylic paint. Punch six 2” circles from patterned paper and fold each circle in half. Attach the circles together to form a globe. Insert a lollipop stick through the center. Repeat step 2 with six 3” circles. Attach the two globes together. Add a piece of scalloped paper to the top of the pot and attach a holiday sticker to the front of the pot. Attach a ribbon. Add a piece of floral foam to the painted pot and push the lollipop stick into the foam to secure it in place. Paint and glitter a chipboard star, add a brad and attach to the top of the topiary. Cut thin strips of cardstock and fold them like an accordion. Add them to the pot. Fold a 4” x 4” piece of cardstock in half. Using a border punch, create three 4” scalloped strips and attach them to the front of the place card. Paint a chipboard star with white paint and add silver glitter. Layer two scalloped frames together (I used two shapes that I cut with my Silhouette). Attach the chipboard star and name tag with a brad to the frames. Cut a 6” x 2 ½” piece of patterned paper for the napkin ring. 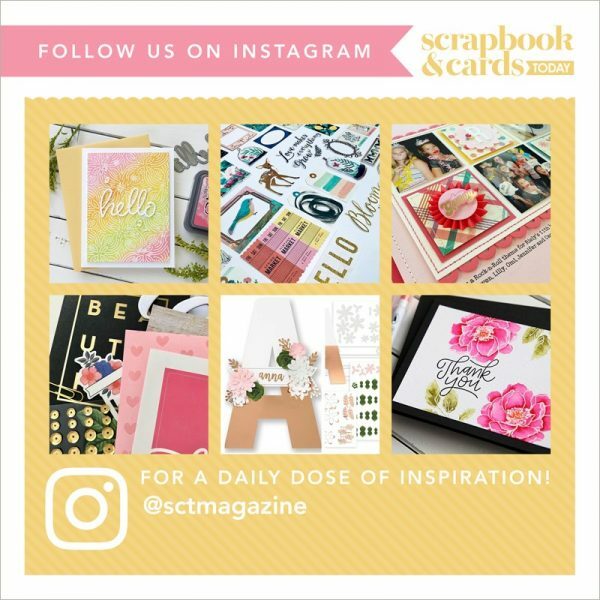 Using a border punch, create three 6” scalloped strips and layer them on the 6” piece of paper. Attach the 6” paper end to end to form a “ring”. Paint a chipboard star white and add silver glitter. 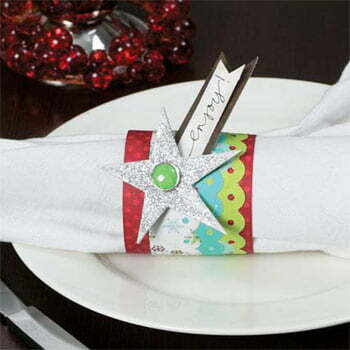 Attach the star and nametag to the napkin ring with a brad.